Enforce governance and security policies to prevent unauthorized use of confidential data in sanctioned SaaS applications. Protect users and the application infrastructure from malicious Internet content. Control use of unsanctioned SaaS applications by monitoring and controlling user behavior. Monitor user actions and enforcing automatic controls based on their behavior. As a component of Citrix Workspace, Citrix Access Control enables a seamless single sign-on (SSO) to all SaaS, web and Citrix Virtual Apps and Desktops using any standard browser. This allows end users get instant access to all apps, data, and files from any device, any network and any location. 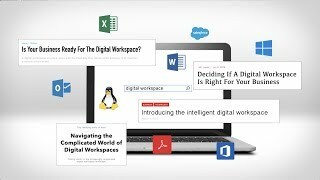 With Citrix Workspace, you can control what actions users can take after they log in to their SaaS applications, such as Office 365, SalesForce, or Workday. Admins can restrict any end-user group from performing functions like printing, copying or pasting. These security policies prevent users from unauthorized dissemination of confidential data. Citrix Workspace allows admins to define policies for what a user can or cannot access on the Internet. With advanced web filtering policies, you can keep users from accessing malicious or non-compliant content on the Internet. For example, you can stop users in Office 365 or Gmail from accidentally accessing phishing links in their email. This protects both the user’s information as well as your entire infrastructure from any malicious content. With Citrix Workspace, admins can define policies for user access to certain websites—such as social media platforms or other unsanctioned SaaS applications—using, using a secure browser session, even if these websites are not blacklisted. With Citrix Secure Browser, a component of Citrix Workspace, users access unknown web links within a secure browser that is streamed directly from Citrix Cloud. This isolates it from the corporate network, preventing any malicious HTML code to from infiltrating your network, thereby decreasing the attack surface. Provide end users with instant access to all apps, data, and files across any device, network or and location with easy single sign-on. Prevent users from accessing malicious or non-compliant Internet content with advanced web filtering policies.